In a bowl add all the filling ingredients & mix well. Adjust salt & pepper as per your taste. Keep aside. Slice off the edges of the bread. In a separate wide bowl, add water and milk. Mix. Soak a bread slice in the water-milk mix for about ten seconds. Lift the bread slice gently and place it on your palm. Squeeze out the water from the bread slice by gently pressing the slice between your palms. Be careful not to break the bread slice while pressing. Place 2 tbsp of potato mixture in the center towards one of the sides of the soaked bread slice. Now, gently roll the bread slice to cover the stuffing completely. Seal the edges of the bread, such that the stuffing does not come out from any part of the bread. Once the stuffed bread roll is sealed on all the sides, place it on a dry plate. Repeat the same process for all the other bread slices. Heat sufficient oil in a wok/deep pan on medium heat. Once the oil is hot enough, gently place the rolls into the oil. Deep fry the rolls - keep turning the bread rolls every few minutes till they are golden brown on all sides. 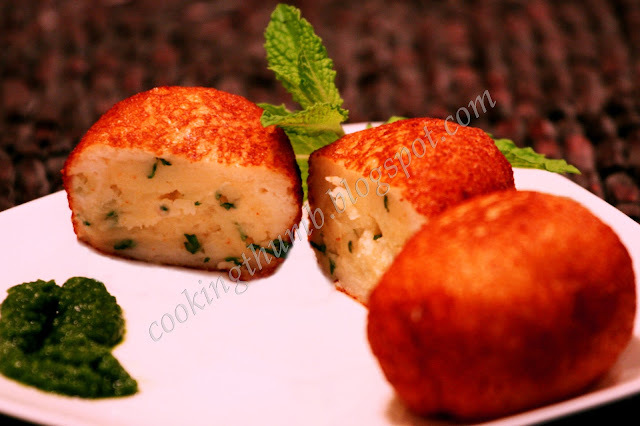 Serve Bread Rolls hot with Green Chutney or Tomato ketchup. Feel free to replace potatoes with any vegetables or even Paneer (Cottage cheese) as the stuffing of your choice. Thanks so much for your recipes. I tried this last evening for some guests, and it was amazing. Thanks for liking the recipe! Each and every recipe of yours is very very good!!! Yesterday I made this for my friends, they had come over for evening tea party and snacks and they all loved it. Everyone was asking me for the recipe. Your recipe made me star for the day!!Thanks!! Thanks for the appreciation! So happy to hear that your friends loved the Bread Rolls. Hope my recipes make you a star again :) Happy Cooking!